Tokaido is six years old, and I am kicking myself I haven’t played it sooner. My crew tends to drift towards games about war, killing, conquest, destruction and murder. We’re not bad people, it’s just that a lot of the bigger board games we end up playing are just about that kind of stuff. I mean, Star Wars is....it’s war, it’s right there in the name. So playing Tokaido lately has been a refreshing break from the carnage, because it’s a game about going on holiday. Players assume the role of travellers, and begin at the western edge of Japan. Everyone then moves east, stopping at points along the way to buy souvenirs, enjoy panoramic vistas, eat hearty meals and meet some strangers. These pit-stops aren’t diversions, they’re the entire point of the game. Every one of them offers some kind of victory point (or part of a combo that earns a greater amount), meaning whoever has the most at the end of the game—signifying that you’ve had the most enriching holiday—wins. The problem is that not everyone can fit. In smaller games only one player can be on any one location at a time, while in bigger games only two will fit. The game takes place on a line (imagine it’s a rail line), and you can only move to locations, so while half the point of the game is trying to have your own best holiday, you’re also able to block access to rivals as well, who might be closing in on a valuable combo, or deprive them of some much-needed cash. And that’s about it. There’s not much to Tokaido. You move left-to-right, stop at places, spend some money, have a good time. I played the game with adults but I’d have absolutely no trouble playing it with my kids. The constant strategic tussle between where you want to go, what you should spend your money on and when you should block others is relentless from the first turn to the last, and the constant to-and-fro this produces is almost perfect. Tokaido is one of those games where you have to sit back and marvel at how the entire experience just dovetails together, and how it manages to do it so calmly. Tokaido is competitive, but it’s the most peaceful, chilled competitive game I’ve ever played. 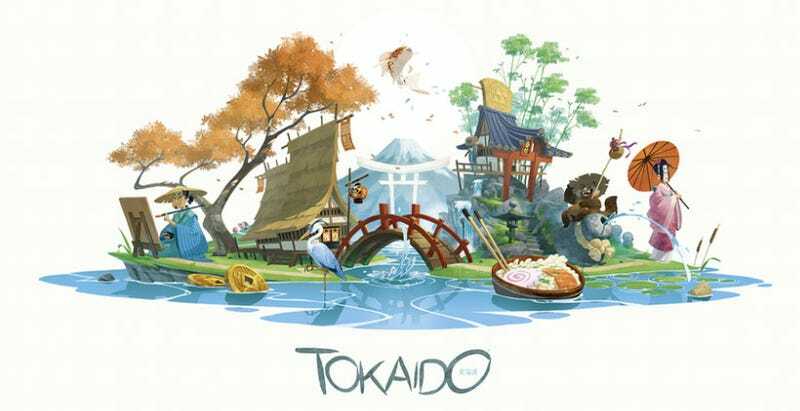 It’s tough talking about Tokaido without mentioning its art, which has become an absolute standard-bearer for what we can expect from a board game. It has a light style that’s Japanese without going overboard into the world of visual stereotypes, with a breezy feel that nods as much to the holiday setting as it does the game’s geographic location. Tokaido is an elegant board game that’s one of the few I’ve played lately that I could recommend to almost anyone. Not just because of its near-perfect design, but because it’s such an easy sell: who wouldn’t want to play a game about going on holiday?